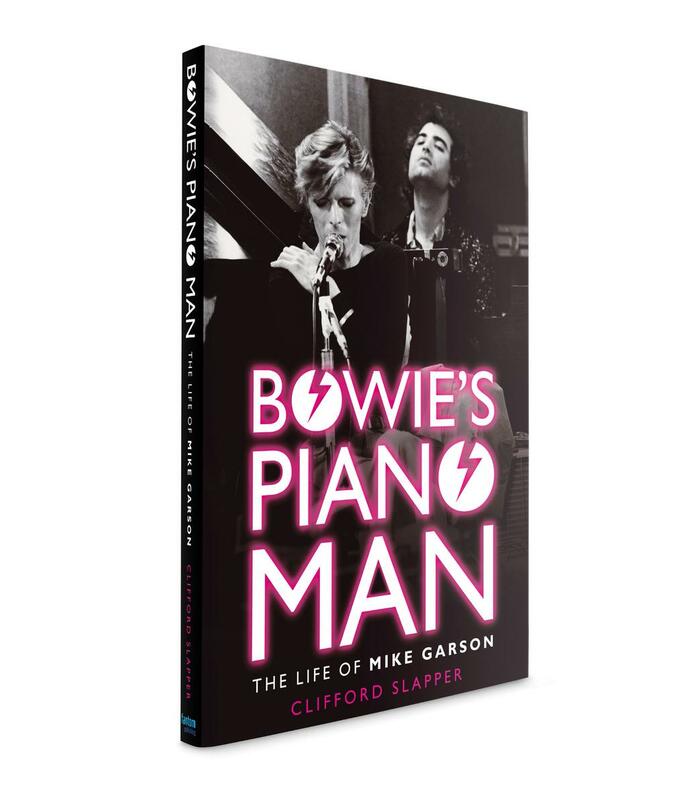 For a musician who has been described as “a cathedral of music”, it is somewhat surprising that Bowie’s Piano Man is the first-ever biography written about pianist, Mike Garson. Even more surprising when you realise the fact, that he has played on 19 Bowie albums, not to mention the countless live appearances he has made over the years, making him Bowie’s most prolific band member. Author, Clifford Slapper – a well respected pianist himself – has worked very closely with Garson during the last five years to document an extraordinary musical life; one which has traversed an individual path from the New York avant-garde jazz scene to a long standing collaboration with Bowie. Garson is recognised as one of the world’s greatest exponents of musical improvisation. From his much talked about masterly solo on the Aladdin Sane track, to his composing by improvising methodology, it is this unique talent and approach that has ensured that Garson remains in high demand with musicians as diverse as Smashing Pumpkins to Nine Inch Nails to St. Vincent to Gwen Stefani. The same prowess that led him to be cast to play the piano as Liberace in a biopic film, or be called upon to collaborate on David Fincher’s Gone Girl film soundtrack. Bowie fans will obviously adore this thorough and well researched biography, but this is not just a book for lovers of Bowie; indeed it is for anyone interested in pop music, rock music, jazz, classical music, and modern culture, and will prove an engaging read for anyone interested in artistic creation of any kind. The fact that Slapper is also a pianist, really helps convey the story as he is able to provide insider knowledge and access to the world of modern music. There are also some great interviews with many of the people Garson has worked with, including Tony Visconti, Earl Slick and Trent Reznor. Bowie’s Piano Man is so much more than a straightforward music biography; it also examines associated themes such as addiction, identity and spirituality which gives it an extra fascinating layer. Refreshingly, Mike Garson is a musician who has never succumbed to the excesses of life on the road. A musician who doesn’t drink, and one who has never taken drugs. Garson describes fame as “the most destabilising of all the drugs.” He prefers to tap into his own musical inspiration to help others, and is an advocate of truly living in the moment. He is also a music teacher, and his past students now run into the thousands. As Earl Slick so rightly described him: “That’s a rare bird…”. Trade release is scheduled for 20th March 2015.